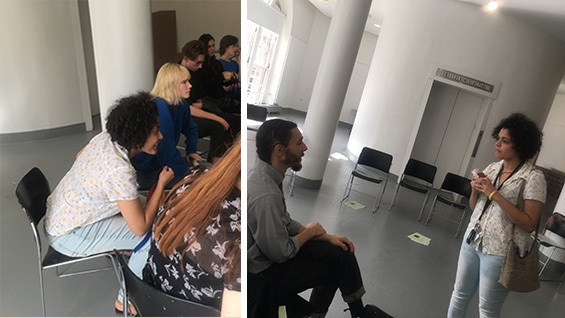 In an effort to better learn about the experiences of first-year students at The Cooper Union's three schools, a member of the communications office followed one student from each school for their first full week of classes. See our introduction. In this installment, Angela Starita, our senior writer, followed Vyczie Dorado-Lopez, of the School of Art. Vyczie Dorado-Lopez came to The Cooper Union via a portfolio review held in Orlando, the city closest to her hometown. As she told us in an interview in August, she was impressed that her Cooper reviewers pulled no punches: “They were the only ones to take my art portfolio and say ‘these won't help you get into The Cooper Union’ to about half of my overall best work,” she wrote. For a student like Vyczie (rhymes with Dixie), who received a lot of props for her work during high school, that attitude was intriguing. Her late mother had been an artist and gave Vyczie considerable advice about technique. When she was accepted at her high school, the Osceola School for the Arts, she further developed her skills and came to use them to explore a number of topics she finds compelling. For one, she is fascinated by conspiracy theories, and they repeatedly appear in her artwork. Watergate, for instance, has preoccupied the 18-year-old artist for more than a year. As part of her entrance portfolio she included an imagined Daily News cover with a drawing of the curved complex that gave its name to the scandal. In Vyczie’s rendering the buildings connote obscurity and corruption, a nautilus of secrets next to a headline reading Nixon Admits ‘Omissions.’ Another drawing from that series, shows Richard Nixon raising his hand in a victory sign, Vyczie’s version of the famous moment before the 37th president ducked inside a military helicopter after resigning to avoid impeachment. During her first week of classes at The Cooper Union, Vyczie, ebullient with a trilling, easy laugh, found herself alternately impressed, bored, entertained, and most frequently, anxious to get making. What follows is a description of what the first-year Cooper artist encountered as a student during week one. In a classroom with large, unobstructed windows facing the north side of the Foundation Building, Vyczie and her first-year classmates met with Professor Armando Mastrogiovanni for the first class of the semester, Freshman Seminar, a humanities course designed to give the newcomers a grounding in classic literature taught thematically. A scholar of comparative literature, Professor Mastrogiovanni, a New England native, laid out the goals of the course, most importantly that students become skilled readers of complex texts. Aware of his audience of aspiring architects, artists, and engineers, he compared critical readers to Eadweard Muybridge, who used photography to discern the elements of a horse’s gait. “You’ll be learning to read in a way that’s hyper attentive and, as we’d say in Boston, wicked slow.” He also underscored the importance of taking notes by hand and coming to class with marked-up texts: “Reading should be as close to writing as you can get,” he said. Armed with a notebook, pen, and panther ring she bought at Goodwill, Vyczie, who exudes a warm and ready intellect, listened as the professor described each of the assigned texts and led a masterful discussion of a section of Plato’s Symposium, teasing out the course’s theme, love and death. After this preview of the course materials, the class—with members hailing from Arizona, Michigan, Brooklyn, Israel, Texas, Korea, Massachusetts, and Venezuela—read and analyzed “The Wolf and the Lamb,” a fable by La Fontaine. What appeared to be a straightforward story about people in power controlling the telling of history, turned out to be considerably more complex. “This is intense,” Vyczie noted. After class, she asked the professor if he minded if she brought in snacks—she later explained that she finds noshing a good way to fight nerves. He told her it was fine if she kept it simple and nothing with strong smells. She tromped downstairs and before heading back to her dorm room, she decided to hit a few stores to see if she could find a part-time job. At 2 p.m. that day, Vyczie attended her second class, 2-D Design, held in 41 Cooper Square. Emily Lessard, principal of Bellweather, a graphic design firm that has created branding and identity for New York City’s campaign to fight climate change, is the class’s high-energy professor. In her introduction, she made clear that she was both approachable and demanding. She told students that she would offer loads of support but that they should remember the importance of presentation. If their workmanship was subpar, she said, they would be told to “get your craft together.” The initial assignments, she told the class, would be very rigid, what she called “visual haikus” that required students to follow very specific parameters. After class, she went to Washington Square, writing letters on paper she had designed with delicate line drawings, almost Victorian in their sensibility. She told students that they would be amazed at what color could do and the ways that combinations would create depth or flatten space. Turning to students in the front row, she commented on the colors they were wearing and how those worked not only with each other but in relation to a larger environment. The class members’ sartorial choices, which tended towards a retro aesthetic, gave Professor Osinski a lot to work with that day: tee shirts touting the likes of Paul McCartney, AC/DC, and the Hooters restaurant chain; orange-tinted glasses (the wearer declared disco as one of her art inspirations); and flowing robes reminiscent of the Pre-Raphaelites. Besides the caftan, Vyczie herself was wearing Converse high-tops decorated with a Campbell’s tomato soup label via Warhol. Notably, one student eschewed nostalgia by sporting a simple white tee shirt with a large heart cut out of its front. Later that day, Vyczie sat in a darkened room in the basement of 41 Cooper Square to hear Professor Colby Chamberlain introduce his course, required of all incoming art students. He prompted the class’s first discussion by presenting a photograph of a work by Josiah McIlheny, “Modernity, Mirrored and Reflected Infinitely” (2003), a display case filled with mirrored blown glass. In addition to being lined with reflective surfaces, the case’s front is sealed with a two-way mirror. “What can Josiah’s work tell us about modernity,” Professor Chamberlain asked. Izzy, Vyczie’s roommate, offered, “It’s aware of itself in the continuum of history.” Others recognized the piece as a commentary on mass production, the hand of the artist, and imagery. After considerable discussion about the McIlheny piece, the professor presented Édouard Manet’s “A Bar at the Folies-Bergère” (1882). The painting’s complicated (and controversial) depiction of mirror images made an interesting foil to the contemporary piece, and the class weighed in with their opinions about what was depicted and why. Back at 101 Astor Place, Professor Mastrogiovanni's class got down to the literary analysis that is the heart of the Freshman Seminar, "watching meaning emerge from the text," as the professor had put it the previous Tuesday. "We're going to develop a taste for difficulty and weirdness." They began discussing Antigone, the first of Sophocles' three Theban plays to be read this semester. The story of familial loyalty pitted against civic authority easily prompted discussion. "The professor gestures a lot," Vyczie notes by way of praise. "I love that he's so passionate about the play." But at one point in the class, Antigone and Creon's battle of wills took a back seat to a more immediate problem: Vyczie spilled coffee on her shirt and pants, but in an effort not to disturb the class, she remained seated with the increasingly cold coffee permeating the cotton of her summer shirt. She was embarrassed at the time, but a few days later was philosophical: "The universe has strange checks and balances." After having most of the morning free to search for jobs and look at storefronts in the East Village (“There’s a store filled with dried flowers!”), Vyczie arrived for her first class in the Foundation Building, 3-D Design. It was held on the fourth floor, and to the eyes of at least one visitor, the classroom space appeared to be more of a lobby than a separate room. This was due to the building’s famed round elevator at the room’s center: though it was supposed to skip the fourth floor during class, it still opened and closed throughout the first hour of class. 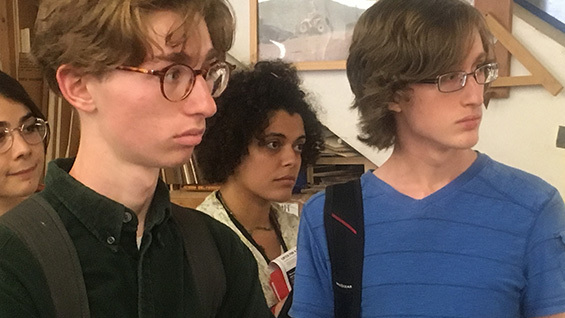 The course instructor, Professor Matthew Schrader, noted the liminal quality of the room and asked students to introduce themselves by giving their names and other information, as well as making one observation about the space. When it was her turn, Vyczie explained that she wants to do performance and mixed-media art, and likes to use sound and music when displaying her visual work. She said she frequently uses sunflowers in her work and is inspired by biology, the predictions of the stars, and the Galapagos Islands. She found the room’s shape “annoying,” and as a result thinks it’ll be a good place to work. Most of her classmates provided equally disparate self-portraits: Adriana described herself as someone who enjoys “fruitless attempts at trying to fight the inevitable,” while Austin told of being deeply moved by the High Line, seeing it as a cure for some of New York City’s ills. 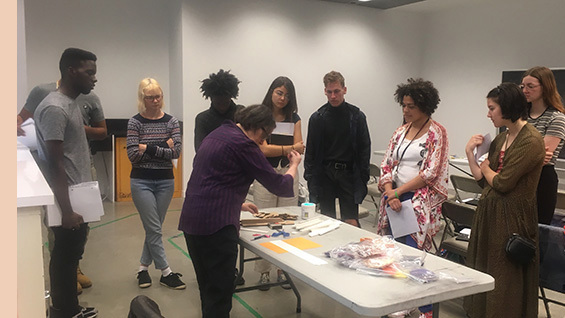 Professor Schrader—an artist new to teaching at Cooper who recently returned to the city from Philadelphia—listened closely to students, then asked them to be attentive to spaces and how they can be changed even by slight interventions. His own work often involves architecture, including pieces in his recent exhibition, “a high frequency alternating current,” which was centered on a Mies van der Rohe building in Baltimore. He directed students to meet him at the Art and Architecture shop on the fourth floor where they would be fabricating work for his class. Before leaving the classroom, Vyczie stayed behind to ask the professor if snacks were allowed during class time. He had no objection, and they left for the shop. Once there, Vyczie and her classmates met Eric Monasterio, a shop technician and instructor, who gave students a broad overview of what they could accomplish in the shop, underscoring the need for safety and to ask any questions at all. He explained that they’d be rotating sections every 7 weeks, so that everyone would eventually learn how to use all the tools at hand. Vyczie was impressed with the shop since her high school had had a much smaller space for fabrication. And she was thrilled that “this place has a metal working station! At my school, kids rarely welded. That was more for the tech majors and I was a visual arts major. That's so cool, and I can't wait to work with that.” The next day when she returned to the studio, for her Techniques class, she found she’d been placed in the computer section for the first seven weeks to learn Photoshop and Illustrator. Arriving on the sixth floor of the Foundation building for Professor Will Villalongo’s drawing class, Vyczie pointed out some bruises on her inner arms to a visitor. “They’re from carrying home a trunk I found last night in Chelsea. I was there for the gallery openings. Chelsea has the best trash!” She’d gone to the neighborhood to see the art, of course, but also to find a gallery to exhibit her own work. Professor Villalongo began his class with an overview of the course, explaining that in addition to drawing in class, they would be making artists’ visits, and field trips to galleries and museum. "This class is all about going back to basics. You may feel like it’s remedial, but that’s not you, it’s because I am stripping your work down to the elements.” He then set up a still life made up of a random arrangement of boxes and asked students, who had all come prepared with pads and charcoal, to begin drawing. Vyczie worked on her piece, which included shadowing. The professor, an alumnus of The Cooper Union, instructed her to work only on the necessary lines to convey the scene and that the shadows were a sort of “cheating.” She understood what he meant, but worried that she was being made to learn what she already knew. Yet in his comments to the class as a whole, Professor Villalongo anticipated this very objection. He was there to challenge them no matter what they already knew or thought they knew. “The first year of Cooper Union was the toughest thing in my life. There will be serious parameters set on your work this semester, but it’s good for you!" With no classes the following Monday, Vyczie's first week of coursework at Cooper was done. Over the weekend, she read for Freshman Seminar, bought supplies, and started collecting color swatches for the first assignment for Professor Osinski's class. "Sunday I was supposed to clean and do grocery shopping, but I bailed on that to go to DragCon," she reported. The annual event, which began in 2015, was held at the Javits Center. She had set out to meet Milk, a former ice skater who was a contestant on RuPaul's Drag Race, but the line proved to be too long. No matter: ever resourceful, Vyczie kept exploring and then "ended up running into Dali Spice, which was AMAZING," she announced in an email. A drag queen named for an artist, a Bosco Sodi brick, coffee stains, a color study, Greek tragedy, relearning to draw, metal shop, and mirrored boxes. Maybe it was all just dumb luck; maybe not.